If you’re in Taiwan, or have some vague knowledge of Taiwan movies, you’ll probably know about the most ambitious project undertaken in their movie history. If not, then I’ll tell you anyway. The movie in question is “Seediq Bale”. It translates to, “A Real Man” in the Seediq langauge, a motif which is repeated throughout the movie. 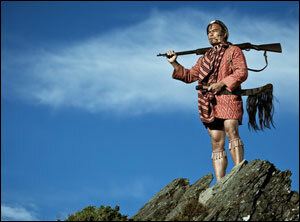 The Seediqs are a Taiwanese aboriginal tribe, and have actually only recently been recognized as an aboriginal group. The film, which depicts the Wushe incident, presents a Taiwan in the midst of Japanese occupation. If the title didn’t tip you off, our protagonists are the aborigines of the this tribe (though unfortunately, no actual Seediqs portray any major characters). The main character is Mona Rudao, a prideful Seediq who resents the Japanese occupation, but grows to be bitter and inactive. What was once a hunting ground for the Seediqs becomes a mere territory for the Japanese. Thus, many of the young men are becoming tired and frustrated from their treatment under the Japanese. However, there is a twist; like a historical movie should, the Japanese are not necessarily the “villains” of the piece. For all the initial mistreatment that was suffered from the Japanese, there were benefits. The Seediqs all received education, infrastructure development, and many other improvements. At this point, I began to give it some thought. If the movie was meant to paint the Seediqs in a gray light, then it succeeded. Other than a few arrogant japanese, it is mostly from the Seediq’s perspective about how they’ve been oppressed. Generally, the Japanese acted only condescending towards the Seediqs, which really throws a curve ball at you; are the Seediqs justified, or did they simply take it too far? Try as I might, it was hard for me to hate the Japanese, at least within the movie. Without a doubt, there were many atrocities committed during the Japanese colonization of Taiwan; some which ranged from violent suppression of anti-Japanese groups, to street violence. Considering that I myself am Taiwanese (okay you can make your guesses), it was an interesting perspective; to be caught between the Japanese who were one of the major influences on Taiwan’s modernization, and the aborigines, people who should probably be considered the true Taiwanese. Visually speaking, it was a fairly impressive movie. The setting had a fairly natural feel, with the forest giving off a sense of mystery. However, some of the CGI was too noticeable. Perhaps the most blatant offenders were the animals, as well as Mona’s meeting with his father’s ghost. The animals came off as too fidgety, while the scene with Mona’s father seemed very cliched. I believe a historical movie should try to stay grounded in reality, not to simply include fantastical elements because they’re common. The music definitely fits many of the scenes; for the dramatic scenes, instrumental tension can be felt. For those scenes of reflection, a quieter aboriginal language can be heard in the background. Overall opinion? I liked the movie. But it’s not perfect. Those who may not enjoy excessive violence may not enjoy it. There is a sense of pride about Taiwan and you sort of empathize with the Seediqs. At the same time, the violence of the movie reminds us not to take it at face value. The Japanese, for all their prejudices and oppression, also had a hand in modernization and development. There’s no real “right or wrong”. Instead, we see how these characters, and by extension how some of these historical figures may have been motivated. This entry was posted on December 2, 2011, 2:34 pm and is filed under Entertainment. You can follow any responses to this entry through RSS 2.0. You can leave a response, or trackback from your own site.